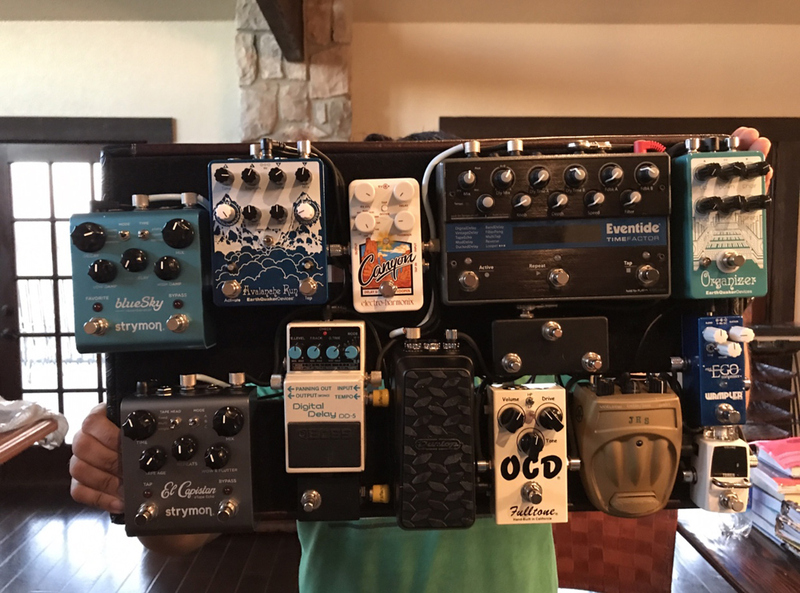 Today’s Pedal Line Friday submission is from Gabriel Hernandez. If you have a pedal line (doesn’t have to be in a board) for your rig, please email me a photo, bio, description of pedals and routing to pedalline@nulleffectsbay.com. Every Friday I’ll showcase a pedal line submission. Make sure you include any links to your band or music page. I wanted to share my pedalboard that was rewired back in November 2017. Paul Trejo (ThereGoesTrejo) helped a lot and his expertise came to good use. You should check out his boards as well. This board usually sees the most playing time at church and playing with the ThereGoesTrejo worship band. It gets used for the drone/shoegaze music on the side as well but not nearly as much as it should. So, below is the order of the chain. The ocd and modded dano give me all of the versatility I need for gain stages. The ocd does a great job of giving a good mosfet crunch without getting muddy and the dano is very transparent and does a great job of pushing the ac-15 and frenzel amp into overdriven territory. If needed, the ego compressor adds some volume. The organizer is usually set to add two octave up and two octave down for massive leads. The delays do exactly what they should do be each have their own sound. The eventide has multi delay settings on most of my presets and are usually set to digital settings. The dd5 is almost always set to the reverse setting and the ehx canyon is usually set to the shimmer mode on 1/4 notes. The avalanche run is usually set to 8th notes with the feedback set pretty heavy. The droning on that pedal is out of this world.The el cap is usually set to dotted 8th notes with modulation. This pedal along with the bluesky and dd5 are always on for swells. Finally, the reverb. The bluesky has been great and is usually set to the plate on normal mode. The favorite setting is set to hall with modulation. The shimmer isn’t my favorite so the ehx canyon handles that region pretty well. So, that’s pretty much it!